I would really have liked to have been around when George Washington was our first president! That must have been such an exciting (and challenging, to be sure) period in which to live. Everything about the new country was, well, new. Considering that Neoclassicism was a rising star art style in Europe at the time of our Revolution (spurred on by the discovery of the ruins of Pompeii in 1748), it’s no wonder that Americans embraced the style after our victory in the Revolution. What more perfect style—a harking back to the ancient democracy of Greece—to adorn the new country? 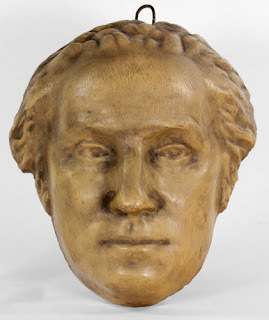 On an art historical note (of course), one of the pioneers of Neoclassicism was intimately, as an artist, connected with the new United States: Jean-Antoine Houdon. Houdon grew up in an art academy near Versailles, where his father was caretaker. At 15 he studied sculpture under the prominent sculptor Michel Ange Slodtz (1705–1764), an artist whose classicism was infused with Baroque drama. After receiving a scholarship for the French Academy in Paris, he studied under Carle Vanloo (1705–1765), a painter who specialized in genre scenes that were informed both by Bourgeois Baroque and Rococo sensibilities, and Francois Dandre-Bardon (1700–1785), whose scenes of classical history were infused with Baroque intensity. From 1764 to 1768 he studied in Rome, a time when the excavation of Pompeii excited new study of classical art. His study of ancient Roman art, and anatomy with a surgeon, banished the Rococo style from the direction of his personal style into one of classicism and physical realism. Although his work was well received on his return to Paris, he never secured royal patronage. His patrons were mostly intellectuals, wealthy middle class, and foreigners. The Enlightenment philosopher Denis Diderot (1713–1784) admired his work and set him on the path to major commissions among German nobles, which landed him subsequent work in countries across Europe. 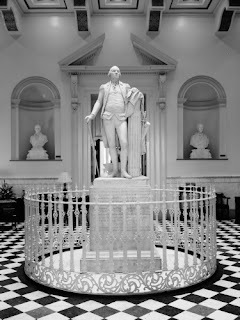 Houdon first met and befriended Ben Franklin when he joined the Masons in 1778, while Franklin was negotiating France's help for the American Revolution. 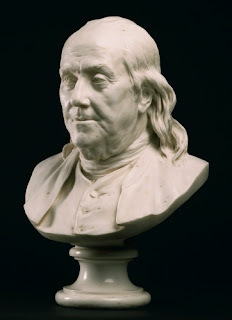 Houdon did several versions of Franklin, in both marble and terra cotta. They are all busts, reminiscent of the ancient Roman penchant for memorializing ancestors, especially in the aspect of the incisive, unvarnished realism. Though a couple—in which Franklin is clothed in ancient garb—have a slight idealization, Houdon's mastery of anatomy produced a sensitive, revealing portrait that exudes intelligence, as well as gentleness. Houdon’s friendship with Franklin led to commissions of prominent men of the new republic. In 1781 he executed a bust of John Paul Jones (1747–1792), the American naval hero of the Revolution, and, in the same year, a portrait of Gilbert du Motier de Lafayette (1757–1834), the French aristocrat who fought for the United States. In 1785, the state of Virginia wanted a commemorative sculpture of Washington, and Houdon sailed to America in September, returning to France in December. While here, he spent two weeks at Mount Vernon. Imagine our humble, reserved future first president getting life masks made of his face and having his arms, legs and chest measured by Houdon! This plaster version comes from that life mask. Doesn’t look like our dollar bill, does it? Aside from this regal portrait of our first president, Houdon also executed many busts of Washington, some with pseudo-classical raiment. Other early American notables Houdon sculpted were our third president Thomas Jefferson (1743–1826) and engineer/steamboat inventor Robert Fulton (1765–1815). Ironically, the artist who pursued Neoclassicism with such aesthetic integrity saw his career flag after the French Revolution (1787–1799), when the political opportunist/art dictator Jacques-Louis David (1748–1826) took over the French Academy during the Revolution and under Napoleon’s dictatorship. David’s idea of classicism was grand history painting that somehow edified the French government. He hounded Houdon out of many commissions, even accusing him of being a “counterrevolutionary” at one point. The French Revolution, which was supposed to instate American-type democracy, instead installed an emperor, and the greatest of Neoclassical sculptors saw his career dwindle in his later years.